The delightful hat is a 1937 creation of Elsa Schiaparelli in collaboration with Salvador Dali; the girl was made by combining and altering 2 different photos; the background is my daughter’s photo of her own shoes (I know…); texture by Kim Klassen; quote by Mimi Pond. Beautiful collage and the quote is true. The shoe hat/shoe is clever. 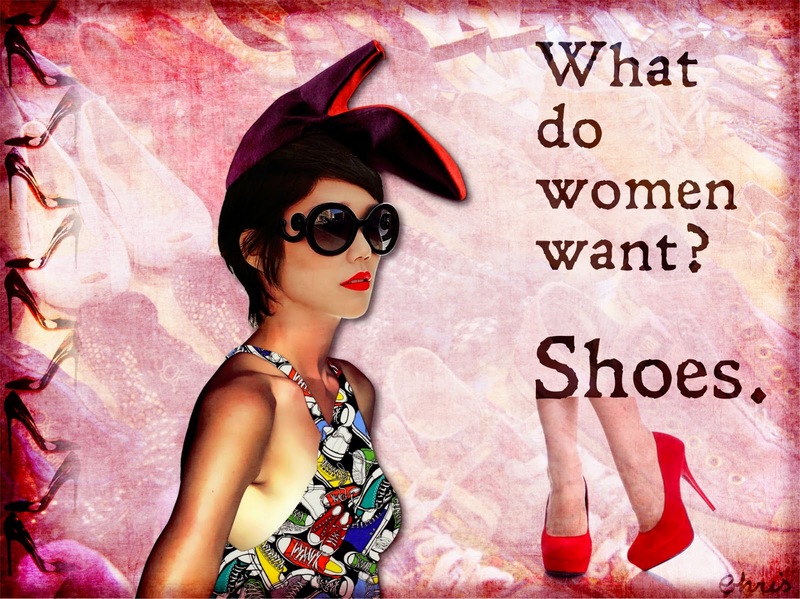 Wow, what a hat and those shoes - stunning but I'll stick with my flats, Christine, fab quotes with a great collage to match! good you put out the background photo!! great idea... and the foreground is wonderful, of course! Great piece and superb quotes! I love the quotes and the collaboration. The shoe/hat is a real winner. Thanks for brightening my day! EVERYTHING about this one, Chris, is superb .... hat, shoes, quote and gorgeous girl. Great job. A very nice entry Chris. Well, if you can't wear 'em on your feet, the head is obviously the next best place!! this is delightful, Chris. I love it.